This project has been prpgressing slowly for some time and although I have only just got it working in 2017, much of the work was done during 2016. Way back in about 2011 while looking for ideas for a talk I was presenting on Simple Radio Receivers, I came across a series of articles on the web by Rick Andersen KE3IJ. 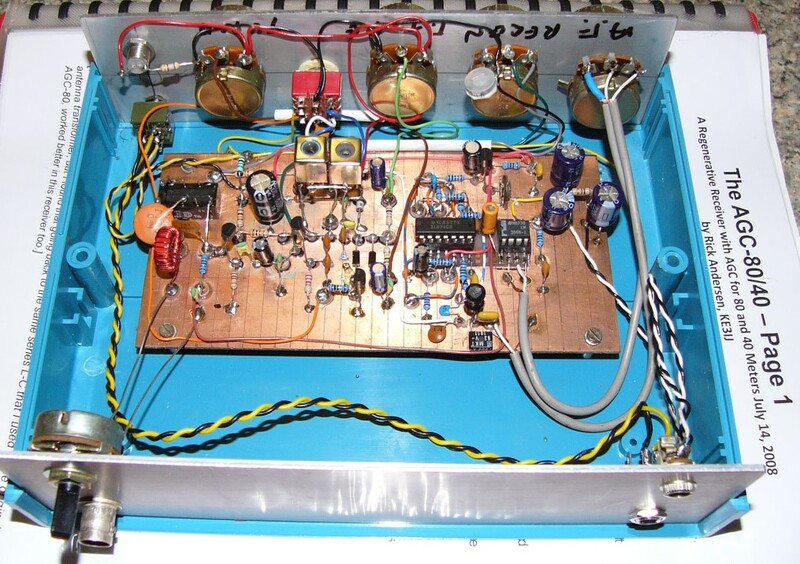 On his web site “Rick Andersen's Simple Home-Built Radio”, one project in particular sparked my interest. The July 2008 - The AGC-80/40 Dual-Band Regen with Audio-Derived AGC. When I find something on the web that I think I may need later I make a PDF copy of the web site and save it as both a file and a printed copy. Do a web search on KE3IJ and look at his other projects, time well spent. Early 2016 I found Jaycar had packets PCB Breadboard disks and DIL mounting kits, tiny pieces of PCB that could be glued onto a blank PCB to make isolated pads to solder components and connections to. I then rummaged in a folder with the title “Simple Radio Projects” and came across the AGC-80/40 article. My first thought was to make this a radio club project but as I got further into assembling it I decided it was too complicated for many inexperienced club members but would be a good demonstration of how these bits of PCB could be used. I made some 5mm square ruled graph paper and started to plan out a layout. I then scribed the same 5mm grid lines on a clean piece of PCB and started to glue the dots down with super glue. If I changed my mind “dots” could be removed with small side cutters and reused. Before long I had the detector section assembled complete with a toroid core for the 40 Metre band and I was impressed how easy it was to get going and to use. Next I super glued down a DIL pad and assembled the audio/AGC part of the circuit but that was when I ran into problem. I could not find a 100mH choke anywhere in my collection of “stuff”. A quick web search found some on “evil bay” so I purchased ten and put the project on hold in a fast food container. The chokes were taking a long time to arrive via snail post from the East and a few weeks later I put the project in the UFO box. UnFinished Object, thanks Les, VK5KLD for that very expressive title. After Easter 2017 I decided I needed to finish a project or two and a rummage in the UFO box revealed a project that I could not quite remember what it was. It took a few days of head scratching and looking through my excellent project index (?) to work out it was the AGC-80/40 receiver. I soon had my original documentation on the bench with the fast food container with the partly finished receiver and a bag of ten 100mH inductors. That is what I bought these for! I finished off the audio and AGC stages, the RF amplifier and added an LM386 audio amplifier. Looking for test signals, decided the Kanos group on 7.093 MHz week day afternoons would be a good signal source to see if it worked. Tuning was difficult but the regeneration stage worked smoothly and I could even see the AGC working with strong local signal. Trevor VK5ATQ was sceptical about me getting strong enough signals to require AGC but yes, the local fellows did generate AGC voltages and I will be able to use this as a signal level meter in future developments. Now to sort out the tuning problem. The first step was to remove one of the 1N2002 power diodes used as a vari-cap device, making the tuning range much narrower. I found the toroid core for the tuned circuit was difficult to set the band range so I substituted a Spectrum Communications 5u3 Toko style coil which has a tuning slug, enabling me to easily adjust the L value and to set the band ends. Tuning range is now almost all the 40M band allocation and is much easier to tune. I then used an 11u coil for the 80M band and used a 2N7000 FET device to switch in the second 1N2002 diode to get the desired tuning range. To avoid instability in the RF amplifier I added a relay to switch the tuning capacitor for the RF stage from 40 to 80M. I am not satisfied I have got every last ounce of performance out of this project and the next stage is to rebuild the RF amplifier using a FET or a pair of transistors as a cascode circuit and refine the front end tuned circuits. I may even use two more Spectrum Communication coils and perhaps tune them with 1N2002 diodes. Easy to remove and add dots to change the circuit. Post script: After I had written this article I decided to have a look at the Jaycar catalogue to see if HP9565 and HP9566 are still available and much to my dismay they have been discontinued. As of May 2017 there were still some stocks of HP9565 Bread Board dots around some stores. I am sure we can make suitable little squares of PCB ourselves and if anyone knows where else these dots may be available let me know and we can publish this in a future article.